The overarching goal of this project is to develop analytic methods that enable scientists to efficiently and automatcially discover relationships between shape and function in biological systems. This work has been supported by the NSF Emerging Frontiers in the form of a large collaborative effort on bioshape (bioshapes.org, DBI-1053036) and a collaborative project supported by NSF Division of Biological Infrastructure Division on bioimage analysis for understanding pollen morphology and texture (DBI-1262547). Any opinions, findings, and conclusions or recommendations expressed in this material are those of the authors and do not necessarily reflect the views of the National Science Foundation. The practice of identifying pollen has a large number of scientific applications and is used in fields as diverse as archaeology, biostratigraphy (the dating of rocks), and forensic science. Pollen and spores play a particularly important role in paleontology, because they form the most abundant and extensive record of plant diversity, dating back hundreds of millions of years. However, many critical hypotheses in plant ecology and evolution (e.g. the assembly of plant communities, speciation and extinction) cannot be fully tested with pollen data due to the extreme difficulty of recognizing species from pollen and spore material. We are developing methods for automatically classifying pollen based on texture and shape features. This approach has been validated in distinguishing visually similar SEM images of pollen from several different species based on fine scale textural differences, recognition of fossil pollen grains based on training from modern grains, and automatic detection, segmentation and classification of pollen grains in wide-field imagery. M. Urban, M. Sivaguru, I. Romero, G. Fried, C. Fowlkes, W. Mio, C. Jaramillo, and S. Punyasena, ``The application of optical super-resolution microscopy to the study of pollen morphology''. Inaugural Digital Data in Biodiversity Research Conference, Ann Arbor, MI, June 2017. Texture recognition using sparse coding histograms and nearest-neighbor classification: This code include a MATLAB demo for classifying grass pollen SEM images (dataset from Mander et al 2013) which achieves ~77 percent accuracy in species identification. Fast convolutional sparse coding: An implementation by Bailey Kong as described in our tech report. This provides a mechanism for effeciently learning a filter dictionary for encoding pollen surface texture. Spatially-aware Dictionary Learning and Coding for Pollen Identification. This code (implemented by Shu Kong) performs spatially-aware dictionary learning for matching surface texture of spruce pollen grains. The method and results are described in Kong et. al. 2016. There is also a separate code repository here that describes the algorithm used for selecting patches based on greedy submodular optimization. 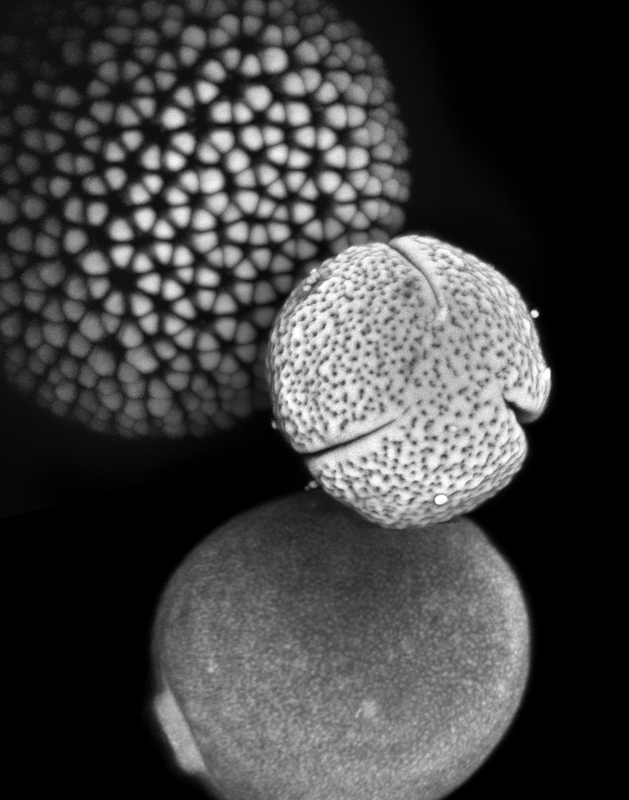 Joint Pollen Grain Detection and Classification with Multiplicative Gating Architecture: This code implements joint segmentation and classification of pollen grains in wide-field transmitted light images using multiplicative feature masking for the classification step. Implementation by Shu Kong. Automated recognition and counting of pollen grain species from field samples: This code implements an (unpublished) pipeline for detecting, segmenting and classifying pollen grains in wide-field transmitted light images. Implementation by Shu Kong. While the particular uses of images as an experimental tool in biology vary widely, the common tasks of recognition, grouping and tracking are ubiquitous. At present, automated image analysis is typically limited to large scale projects that can justify the resources required for development of custom software. The resulting systems are often brittle and require redevelopment each time a slightly different dataset appears. We are working on generic tools that can be interactively retrained by the end user with the goal of expanding the role of quantitative imaging and modeling in biology by “mining the long tail” of under-analyzed experimental data. S. Hallman, C. Fowlkes, "Oriented Edge Forests for Boundary Detection", CVPR, Boston, MA, (June 2015). MATLAB code for training template based detectors for detecting cell nuclei in fluorescence image stacks. MATLAB code for learning and inference in multi-target tracking with pairwise interactions between objects. For a gene to function properly, it must be active in the right place, at the right time, and in the right amount. Changes in any of these features can lead to observable differences between individuals and species and in some cases can lead to disease. We do not currently understand how the position, timing, and amount of gene expression is encoded in DNA sequence. One approach to this problem is to compare how gene expression differs between species and to try to relate changes in DNA sequence to changes in gene expression. We are developing methods for measuring and comparing gene expression patterns at high spatial and temporal resolution between embryos of different species of Drosophila. The methods allow us to control for variation in the size, shape, and number of nuclei between embryos. Nano- and microscale topographical cues play critical roles in the induction and maintenance of various cellular functions, including morphology, adhesion, gene regulation, and communication. Recent studies indicate that structure and function at the heart tissue level is exquisitely sensitive to mechanical cues at the nano-scale as well as at the microscale level. We have developed image analysis tools coupled with an inexpensive culture platform comprised of biomimetic wrinkles that simulate the heart’s complex anisotropic and multiscale architecture for facile and robust cardiac cell alignment. We demonstrate the cellular and subcellular alignment of both neonatal mouse cardiomyocytes as well as those derived from human embryonic stem cells. By mimicking the fibrillar network of the extracellular matrix, this system enables monitoring of protein localization in real time and therefore the high-resolution study of phenotypic and physiologic responses to in-vivo like topographical cues. 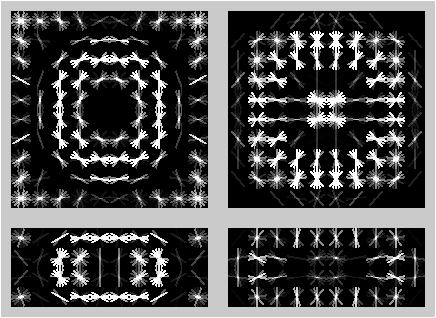 Statistical analysis of collections of shapes typically relies on some measure of distance between shapes which is specified a priori without consideration of the relevance of particular modes of variation to biological function. 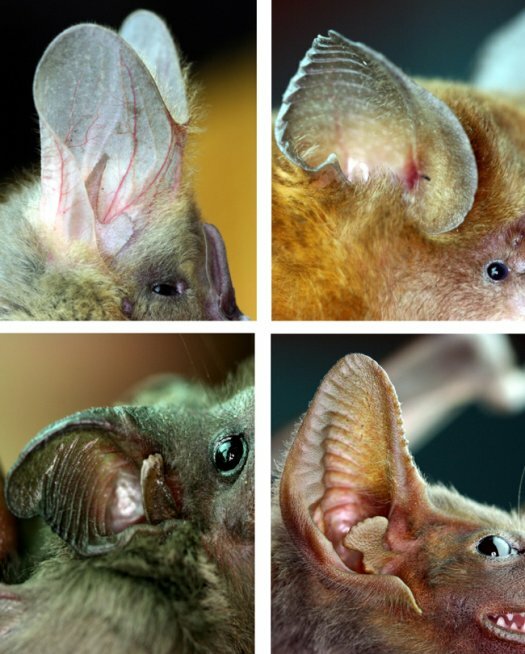 We are developing methods that leverage accurate simulation of acoustical propagation to understand the functional importance of aspects of bat ear and noseleaf shape. We exploit the adjoint method to efficiently perform a global analysis of the sensitivity of acoustical performance to shape features.